Copyright � 2014 Whitson, Karayanidis, Fulham, Provost, Michie, Heathcote and Hsieh. In task-switching paradigms, performance is better when repeating the same task than when alternating between tasks (switch cost) and when repeating a task alone rather than intermixed with another task (mixing cost). These costs remain even after extensive practice and when task cues enable advanced preparation (residual costs). Moreover, residual reaction time mixing cost has been consistently shown to increase with age. Residual switch and mixing costs modulate the amplitude of the stimulus-locked P3b. This mixing effect is disproportionately larger in older adults who also prepare more for and respond more cautiously on these "mixed" repeat trials (Karayanidis et al., 2011). In this paper, we analyze stimulus-locked and response-locked P3 and lateralized readiness potentials to identify whether residual switch and mixing cost arise from the need to control interference at the level of stimulus processing or response processing. Residual mixing cost was associated with control of stimulus-level interference, whereas residual switch cost was also associated with a delay in response selection. 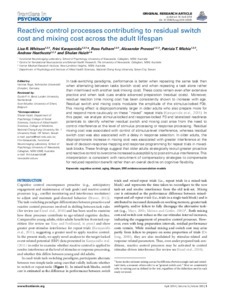 In older adults, the disproportionate increase in mixing cost was associated with greater interference at the level of decision-response mapping and response programming for repeat trials in mixed-task blocks. These findings suggest that older adults strategically recruit greater proactive and reactive control to overcome increased susceptibility to post-stimulus interference. This interpretation is consistent with recruitment of compensatory strategies to compensate for reduced repetition benefit rather than an overall decline on cognitive flexibility.